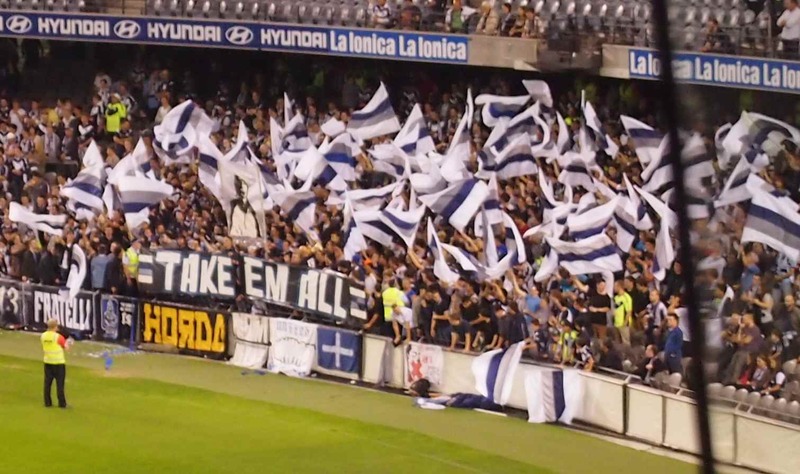 After being on the back-foot for much of the ninety minutes, Melbourne Victory got a last gasp penalty kick to equalise an early Perth Glory goal, then completed the come-back with an Archie Thompson goal in extra-time to set up a semi-final with Central Coast Mariners. Coach Ange Postecoglou bristled at the suggestion that his team had got out of jail with the manner of the win, and pointed out that football was always throwing up events like those of the concluding minutes of this encounter. His opposite number Alastair Edwards hid his disappointment behind his praise for the performance of his players in the eight games since he took over. His pride in their efforts was palpable and he did not try to disguise the fact that the players themselves were very angry at the loss of a match they could and should have won. After some early sparring in which victory found it hard to keep possession and the visitors looked very comfortable, Perth took the lead with an odd sort of goal. In the 15th minute Jacob Burns fed Scott Jamieson wide on the left. The cross was not really testing but keeper Nathan Coe started to come for it, then stopped and Ryo Nagai chested the ball into the space he had left and over the line. It was a most sloppy goal from a Victory perspective. Victory might have replied quickly when Perth gave the ball away at the back but Leigh Broxham’s curling effort flew well wide. Victory’s transition was woefully slow in the first half and there was little for the fans to get enthused about apart from one excellent run by Marco Rojas which set up up Broxham again in the 35 minute, only for the midfielder’s shot to be deflected past the post. 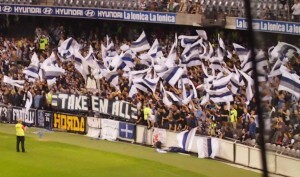 Victory fans were non-plussed when no corner was given. Perth were very well organised at the back but in truth Victory lacked invention and tried to pass their way through without disrupting the composure of Steve Pantelidis, Michael Thwaite and company. At this point, I thought Victory had regressed since mid-season when they seemed to have adopted a high-speed passing game as coached by Ange Postecoglou. In the second half Victory began to come more into the game, though they found it very hard to keep consistent pressure on the Glory by giving the ball away. Jason Geria was booked aftr only three minutes and was quickly replaced by Marcos Flores, which certainly sparked a more fluid attacking game from Victory. 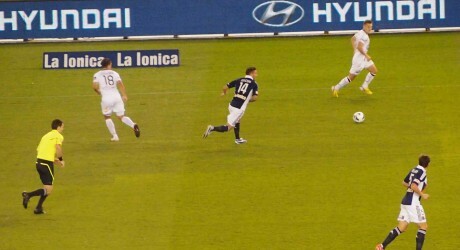 Perth might have had a second goal when Shane Smeltz got clear and Coe once again came off this line and then stopped. It looked like the keeper would concede again, but he managed to deflect Smeltz’s shot then safely caught the ensuing corner. The match turned on two critical refereeing decisions which referee Jarred Gillett got right, even if some of his other interventions were more dubious. 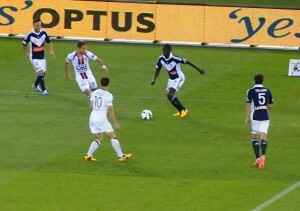 The first was a penalty to the Glory after Scott Jamieson was brought down in the box by Mark Milligan. That was in the 88th minute and should have sealed the game for Glory, but Shane Smeltz hit the bar with his penalty kick and Victory lived on. A minute later substitute Andrew Nabbout was manhandled in the Perth area by Steve Pantelidis, who had earlier been booked for an assault on Archie Thompson in midfield. 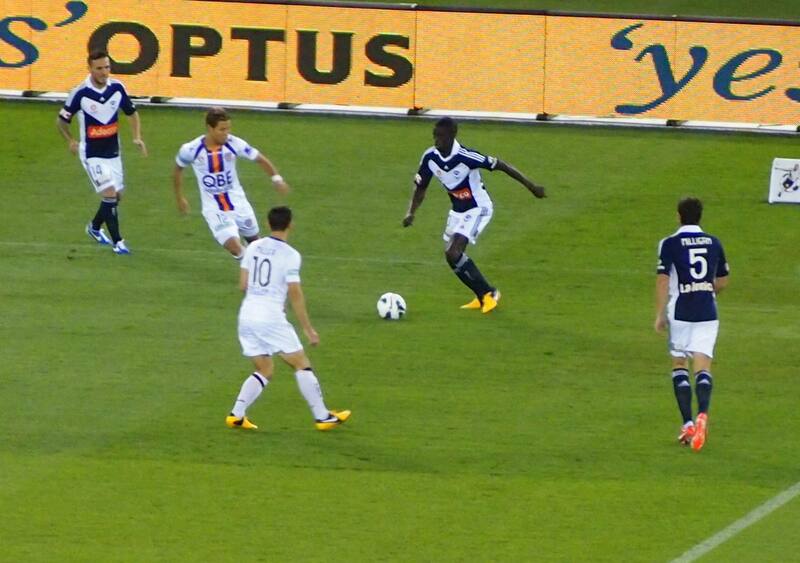 The former Victory defender was cautioned again and sent off while the penalty fell to Mark Milligan. He showed how it should be done with a shot into the corner giving Danny Vukovic no chance. So the game went into extra time. Four minutes into the added time Flores sent Marco Rojas away down the right. The speedy Kiwi outstripped the Perth defence and sent over a cross which Archie Thompson met with a downward header which bounced up and past Vukovic. Victory tried to take the steam out of the ten men by passing the ball around at the back but they were nearly punished when Jamieson again came charging into the penalty area, but this time the referee saw nothing wrong with the challenge on him by a couple of defenders. Players were now going down with injuries or exhaustion but Victory had two late breaks which should have resulted in goals, though tiredness helps explain why they did not. 39. Nathan Coe, 5. Mark Milligan, 6. Leigh Broxham (21. Spase Dilevski 109’), 10. Archie Thompson, 11. Marco Rojas, 14. Billy Celeski 23. Adrian Leijer, 30. Jason Geria (Marcos Flores 48’), 31. Scott Galloway (26. Andrew Nabbout 84’), 32. Connor Pain 33. Daniel Mullen. Unused substitutes: 1. Tando Velaphi. 8. Jonathan Bru. 1. Danny Vukovic, 5 Steve Pantelidis, 7. Jacob Burns, 9 . Shane Smeltz, 10. Liam Miller, 11. Adrian Zahra (8. Dean Heffernan 63’), 12. Ryo Nagai, 18. Matias Cordoba (14. Steve McGarry 96’), 19 Josh Risdon (28. Daniel de Silva 105’), 21. Scott Jamieson, 23. Michael Thwaite. Unused substitutes: 30. Lewis Italiano, 2. Jack Clisby. Yellow cards: Scott Jamieson 26’, Steve Pantelidis 68’, 90’. Red cards: Steve Pantelidis 90’.